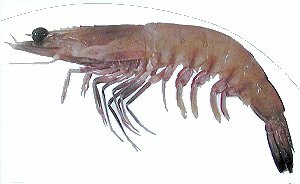 Eastern King Prawns are grooved prawns - they have a pair of parallel grooves running the length of the upper surface of the carapace. The body is cram to yellow. The head grooves are brown and there are short brown stripes on the sides of the tail segments. The tips of the tailfans are blue and the walking legs are yellow. Large king prawns are generally exported frozen, green and head-off. Small to medium ones are sold in Australia cooked whole. They are found along the eastern coast of Australia from Lakes Entrance in Victoria to North Reef in Queensland. They are caught as juveniles in estuaries during spring and summer and as adults on the Continental shelf at depths of 60 to 220 metres from mid-summer through to winter. Normally male eastern king prawns grow to a length of 19cm and weight 110g, while the females can grow to 30cm and weigh 220g. Besides being smaller, males can be distinguished by a petasma (genital appendage) between the first pair of swimming legs. Females have a plate-like thelycum at the base of the last pair of walking legs. They are caught by deep sea netting, or in estuaries by a hand-held net wielded by a wading person using a bright light to attract the juveniles. The light also reflects off their eyes, glowing red, so you can see them at night. Commonly 40-50g and 10-21cm body length, with Eastern King Prawns the largest and Redspot King Prawn the smallest. Eastern can grow to 30cm. High priced, with larger prawns fetching the highest prices and Western and Redspot generally cheaper than Eastern King Prawns. Other Penaeidae prawns, such as Banana Prawns and Tiger Prawns. Average yield is 45%. Has a rich flavour, low-medium oiliness moist flesh with a medium-firm texture. Flesh is translucent when raw and white with pinkish bands when cooked. After removing the head from a fresh green Prawn, hold the Prawn straight and gently pull the end of the digestive tract (from the head end), it will usually come out in one go. If it breaks off, use a thin skewer to hook it out from the back. In cooked Prawns, cut the back open to remove the digestive tract. Steam, poach, deep-fry, pan-fry, stir-fry, grill, barbecue. The firm flesh holds together well in soups and curries and threaded on skewers for kebabs. Like all seafood, Prawns require very little cooking. It is always better to undercook, rather than overcook, them, as they will continue to cook in the residual heat. King Prawns have a particular tendency to become tough if not handled correctly. The Eastern King Prawn, or otherwise recognized as an ocean king prawn, is one of Queensland's premium seafood products. 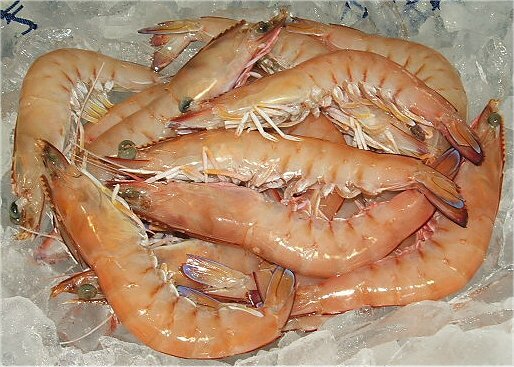 Eastern King Prawns are source by ocean going prawn trawlers along the southern Queensland and Northern New South Wales coastlines. This product is marketed as cooked and raw. The superior texture and taste of this species has been recognized by cultures throughout the world of which Urangan Fisheries readily supplies.